The show’s title "Crossroads" has several meanings. The most obvious is the crossroads the artist comes to when deciding which path to take next. Art is and should be a journey into the unknown; otherwise, what’s the point? Another is a more personal translation. 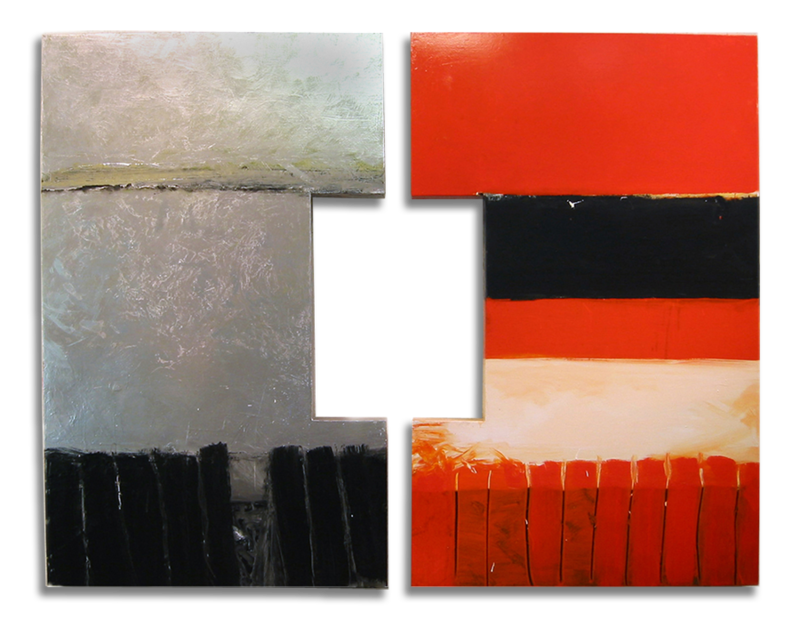 When I created these pieces I was looking for order in a chaotic world. I believe that is how the structure of a crossroads became the underlying metaphor in the works shown here. It started as a process of deconstruction. The pieces rebuilt themselves off a nine square grid, also known as the Lo Shu Square, one of the most important and oldest of Feng Shui tools. No matter how abstract the surface, the "Magic Square" structure gives a sense of order to the work. Over the years I have honed down the figure to it’s most basic form. The 3-dimensional pieces shown here are examples of this figure/form. After a trip to Florence, Italy, looking down streets with walls to the left and right and an apartment spanning those walls two stories up the figure I was working with stretched out and became a landscape. The human figure and a landscape in its most basic and architectonic form creating crossed objects that define support and resistance. The process for me is watching the art come together. It’s physical. The paint, the brushes, the surface, they all get a chance to describe what it is I am trying to express. That’s what going into the studio is all about. It’s construction followed by deconstruction. When the paint finally dries, I expect to be able to relate to the art as an object that can stand on it’s own two feet. That, for me, is when the work feels complete.